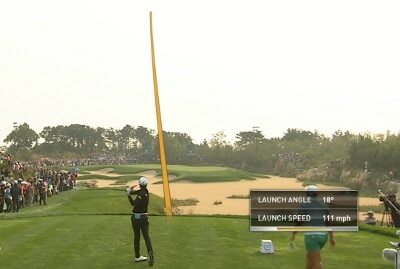 FlightScope Tracer was broadcast live on television in South Korea at this year's South Korean LPGA KEB Hana Bank Championship. The Tracer technology tracked the ball flight and instantly provided parameters, such as launch speed, launch angle and ball spin, while the ball was still in the air. Lexi Thompson, the winner of the event, is shown in the video hitting her tee shot on the 17th.